In a time when mason jars and dessert jars are all the rage, it’s definitely an interesting concept to have beautifully decorated jars available to spice up your home. Say hello to All That Jars. In the last year alone, restaurants all over the city have started using mason jars to serve drinks. Jars with and without handles, fancy shaped bottles and other interesting shapes and sizes to serve you your drinks. Even bars have been adopting this new style and while it might be getting a little too much for you, here’s something else that’s absolutely awesome. 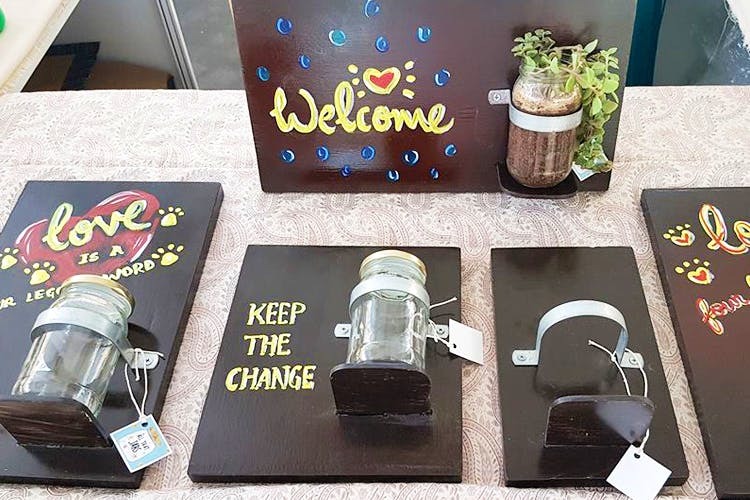 All That Jars is a Chennai-based company that designs jars for different occasions, in different styles. These decorative jars can be used for almost anything at all in your home, your office or even in a restaurant. Started in February 2017 by Nargis and Farida, All That Jars was formed as an idea to repurpose glassware into quirky pieces of art. The two friends started designing a wide range of products that were both attractive and useful; with each piece being unique and carefully created. The jars are priced according to the size of the jar and the amount of work that goes into decorating it, because if you look closely, you’ll see that the artwork is quite detailed and has taken time and passion to create. If you’re wondering what kind of jars they have, brace yourself for this fantastic list. They’ve got money jars (beautifully designed piggy banks, just without the pig), Luminaire Jars (which come with the lights and remote control) that are perfect for display during the day and light up at night. But what is really quite awesome are the magnetic jars which can be attached to the side of your refrigerator or anywhere in your kitchen. Another quite awesome creation is the jar signs, which can be used for your front door! It’s a jar attached to a wooden piece with personalised information! If you’ve got old jars that you’re planning to throw away, do something better. Share them with All That Jars and they upcycle them into decorative jars that you can use at home. The jars are priced from INR 150 to INR 2,000, depending on the size and the design.